Backtrack Blues Band - Way Back Home is 10 out-of-the-box fabulous traditional Blues tracks. The band focuses on harmonica driven Chicago Blues with Sonny Charles leading the way, joined by Kid Royal on lead guitar, Little Johnny Walter on rhythm guitar, Stick Davis on bass guitar, Joe Bencomo on drums, and special guest Victor Wainwright layering in piano. Latonya Oliver and Dana Merriweather add their lovely background vocals to make this release one to own. Backtrack Blues Band - Way Back Home was produced by Charles W. Ross and George Harris, released on the Harpo Records label, and distributed by Flamingcheese Records. The 10-track release opens with three Sonny Charles' songs, Goin' To Eleuthera, which is flat out fabulous with a blazing harmonica intro and Victor Wainwright on piano who keeps the pace for this "feel good" Blues song. Next on the play list is Tell Your Daddy, which has some nice guitar riffs with Victor layering in the piano again on this fine piece. The band continues with Shoot My Rooster which has some nice harmonica passages that show Sonny Charles' prowess as a master on both acoustic and amplified harmonicas. The band segues into the 1958 Chicago Blues song, Your Funeral, My Trial, written by the legendary blues harmonica player Sonny Boy Williamson II (1912-1965) followed by another SBW II song, Checkin' On My Baby written in 1960, which has a long Swing Blues intro. The W. Spriggs song, Nobody But You, had me singing along with the band. Heavy Built Woman, another Sonny Charles song, shines with Victor Wainwright working his magic on the piano and harmonizing background vocals by Latonya Oliver and Dana Merriweather. Also fine is the Philip P. Lynott (1949-1986) song, Baby Please Don't Go. The release finishes strongly with two more Sonny Charles songs, Rich Man Blues, and Help Me Just This Time. Founded in 1980 in Florida, and based in the Tampa area, the Backtrack Blues Band takes its name from the instrumental piece, Backtrack written by the American Bluesman, singer, songwriter Little Walter (1930-1968). 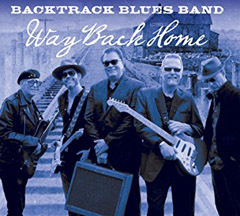 Backtrack Blues Band - Way Back Home is the band's fifth release, and is clearly a winner. © October 2016. Luxury Experience. www.LuxuryExperience.com All Rights Reserved.